The required pants are available through this link. The fitted hats available in the store can be worn in place of the uniform hat that is provided. It will close May 5th and items will be shipped to buyer by May 31st. All tournaments and leagues hosted by Ekhart Titans are now posted and registrations are open. They can be found under the Leagues and Tournaments dropdown above. We are blessed to have formed many great and long lasting relationships through the years. To read the impressions and experiences of former and current players, parents, coaches, umpires and affiliates please CLICK HERE. 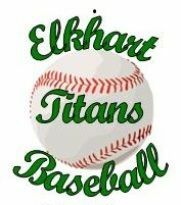 It is the goal of the Elkhart Titans Baseball Club to create an environment that will allow the players to realize their capabilities as baseball players; to develop confidence, self esteem and poise as athletes; to understand that their achievements are a direct result of their efforts; to teach the integrity of the game of baseball and to help players understand the greatness of the game while learning the life lessons associated with baseball and to understand that sportsmanship, not showmanship, is the major ingredient in playing with class. Our goal is to teach the fundamentals of baseball and to prepare our boys for high school, college, and a higher level of success in the game of baseball and the game of life. We take the love of the game very seriously, while at the same time seeing that the boys have fun and enjoy the great game of baseball.